Get ready for a no holds barred debate and discussion of the current state of the comic book marketplace in publishing, television, and film. Like sports reporters at the World Series, these podcast hosts voice their opinions on their shows. But what happens when they face each other and may not get the last word on a subject? Featuring John Siuntres (Word Balloon), John Mayo (Comic Book Page) and Kay Kellam (Pop Arts Place). This entry was posted in Podcast, Podcasts, PopArtsPlace and tagged 2016, CCI, Comic Con, John Mayo, John Siuntres, Podcasting Panel, San Diego Comic-Con, SDCC, Word Balloon on August 3, 2016 by Kay. 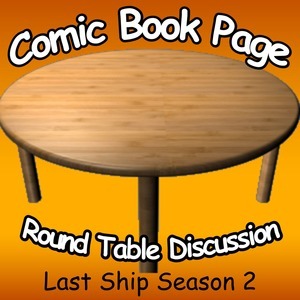 John Mayo, of ComicBookPage, and Kay Kellam, of PopArtsPlace, have a spoiler filled discussion about the second season of The Last Ship. With some discussion of the first season, where things left off, how they picked up in Baltimore, and who had possession of “The Last Ship” moving forward into the conflict with “the immunes,” and closing out with some speculation on where Season 3 will pick up the story. This entry was posted in Novel, Podcast, Podcasts, PopArtsPlace, Television and tagged Adam Baldwin, Boston Legal, Brothers & Sisters, CCI, Chandler, Charles Parnell, Comic Con, Comic-Con International, ComicBookPage, Dr. Scott, Eric Dane, Go Navy, Grey's Anatomy, Hulu, John Mayo, John Pyper-Ferguson, Last Ship, Mark Sloan, McSteamy, Michael Bay, PAO, PopArtsPlace, Public Affairs Officer, Rachel Scott, Rhona Mitra, San Diego Comic-Con, SDCC, Tex, The Last Ship, TNT, William Brinkley on October 16, 2015 by Kay. John Mayo, of ComicBookPage, and Kay Kellam, of PopArtsPlace, talk about their adventures at Comic-Con International 2015 in this third part of the three-part Comic-Con 2015 coverage. Discussing Saturday and Sunday, this portion of the podcast involves, among other things, talk of seeing X-Men: Days of Future Past, The Rogue Cut, as well as participating in the 10th Annual All-Star Podcasters Panel. This entry was posted in Convention, Podcast, Podcasts and tagged CCI, Comic Con, Days of Future Past, panel, Podcast, Podcasters, Power Rangers, Rogue Cut, Saban, San Diego, San Diego Comic-Con, SDCC, X-Men on July 24, 2015 by Kay. John Mayo, of ComicBookPage, and Kay Kellam, of PopArtsPlace, talk about their adventures at Comic-Con International 2015 in this second part of the three-part Comic-Con 2015 coverage. This entry was posted in Convention, Podcast, Podcasts, Review and tagged 2015, 360 Viewing Experience, Anthony Lemke, Arrow, Artificial Intelligence, Axanar, Breckin Meyer, Bruce Boxleitner, CCI, Comic Con, Comixology, Continuum, Crazy Talk 7, Dark Horse, Dark Matter, David Blue, Detective, Doug Jones, E.J. De La Pena, Firefly, Gaslamp Quarter, Image, Image Comics, Indiegogo, Kickstarter, Loot Crate, LootCrate, Melissa O'Neil, Mira Furlan, Neil Kaplan, Nobility, NobilityTheSeries.com, Optimus Prime, Prelude to Axanar, Quinton Lance, Renegades, Robert Picardo, Roddenberry Entertainment, Roger Cross, San Diego Comic-Con, San Diego Public Library, SDCC, Space Command, Star Trek, street team, SyFy, Tamlyn Tomita, The Office, Trailer, Transformers, trolley tracks, Web Series, White Room on July 22, 2015 by Kay.